To make this dish you need to start planning in autumn. What? You didn’t plant your garlic bulbs last fall? Ok then, just find yourself a farmers’ market and purchase some new garlic with its greens still attached. The young garlic is still tender and usually, although this also depends on the variety, has a milder, less pungent flavor. Still, this recipe is guaranteed to keep the vampires away! Use it on pasta, in sandwiches, and on bruschetta, which is an Italian-style toast. Remove the greens from the bulb with a knife or culinary scissor. Reserve the bulbs for other recipes. 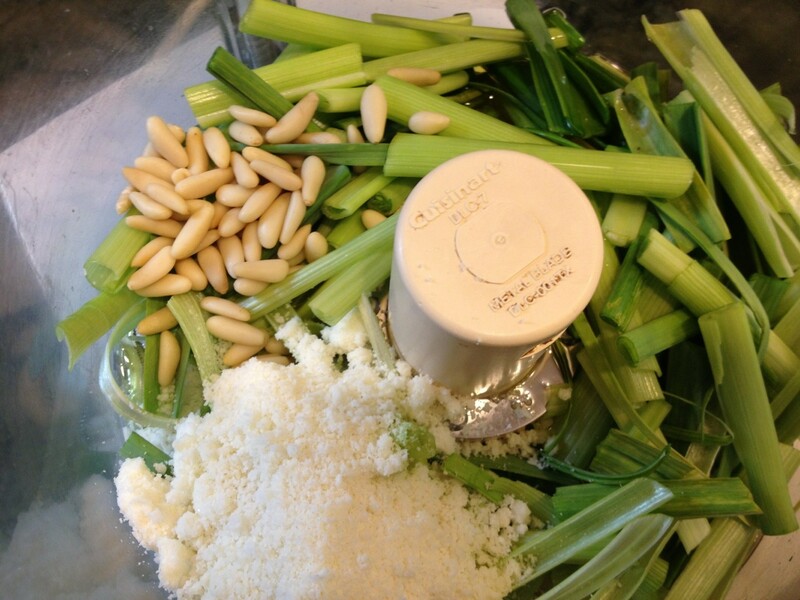 If using a food processor, help it out by precutting the garlic greens into 2″ pieces and/or peel the leaf layers almost like you would shuck corn. Add cheese, nuts, and olive oil. Process until it comes together into a paste. You may need to add more olive oil if it’s too thick. 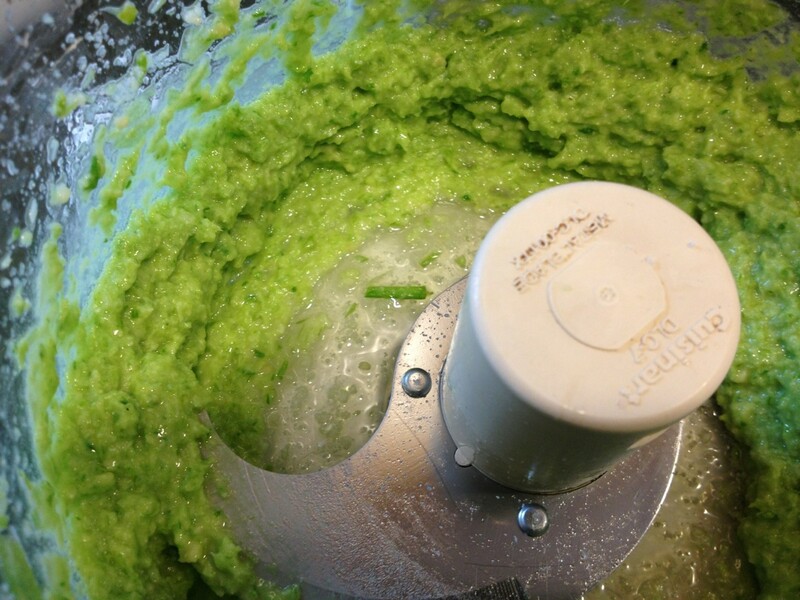 If you’re using a knife instead of a food processor, use the peeling method. Then chop into tiny pieces until you wish you had a food processor, but smile because you’re building all that upper body strength. Mix the minced greens with the remaining ingredients. 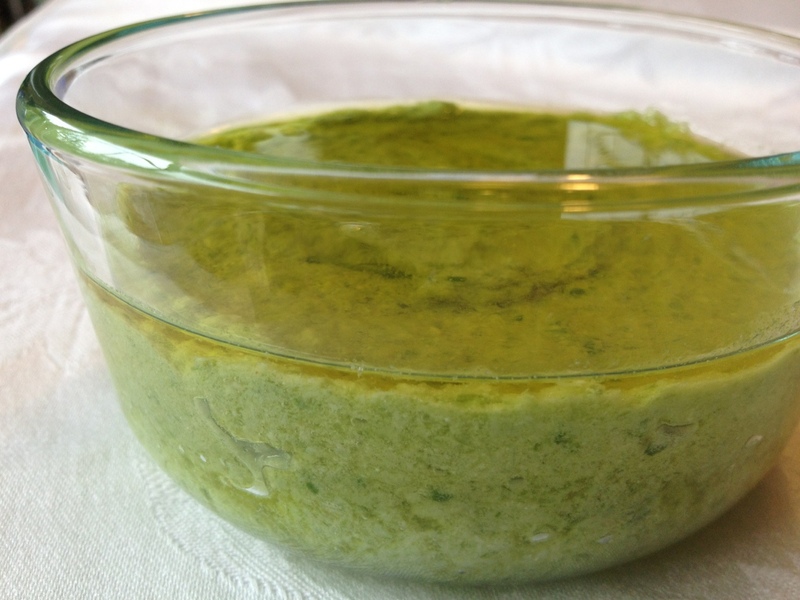 Place the pesto in a covered jar with a layer of olive oil. Store in the refrigerator.